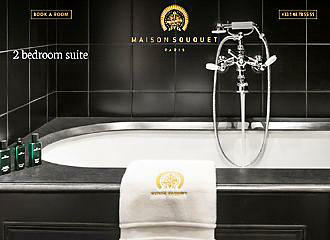 The Maison Souquet is a small intimate 5 Star hotel with 20 rooms and suites that has been designed with features reminiscent of the Belle Epoque period and famous courtesans, and with a discreet bar, butler service, 24 hour room service and a spa where you can request a key for its use with swimming pool and hammam, this will provide you with a luxurious, romantic stay. 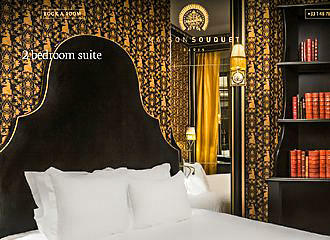 The Hotel Maison Souquet is named after Mme Souquet who created a discreet maison close, or brothel where it was frequented by politicians, bankers, artists and so on, although after a couple of years it became a regular hotel. 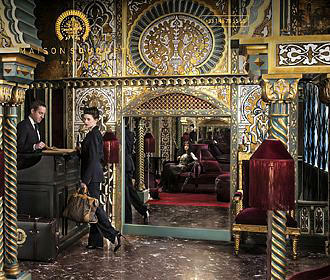 It was back in 2013 that the premises was acquired by a company called the Maisons Particulieres Collection who completely renovated the hotel, employing the French interior designer, Jacques Garcia, to make this into a sumptuous and intimate 5 star hotel, reminiscent of the Belle Epoque period and its history. 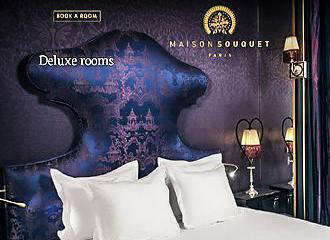 Designed with furnishings from the late 1800s to the start of the 1900s, over 120 metres of different silks from the best textile merchants were utilised to provide an elegant, romantic and haute couture environment, which have been combined with unique art works adorning the walls throughout the hotel. With a lounge and reading room decorated with rich woodwork, a monumental fireplace and board games available, through to the winter garden, the Maison Souquet is a hidden gem that has an unassuming facade with two red lamps on the outside, reminiscent of those brothel days. The expertise of Jacques Garcia who has worked for The Louvre Museum and the Chateau de Versailles, has created an atmosphere of elegance and passion, mystery, exoticism and sensuality including an eclectic collection of furniture that provides a unique authenticity and spirit to the former luxury pleasure house, which is ideal for a romantic weekend in Paris. As you would expect from a 5 star hotel in Paris, you get all the usual refinements including double glazing, soundproofing, heating, air conditioning plus free high speed WiFi throughout, along with a 24 hour reception and multilingual staff. You may be pleased to known that the Maison Souquet is suitable for the disabled, being fully accessible to those with reduced mobility in addition to providing equipment for those that are visually impaired, plus it is also family friendly. Concierge services are also available for restaurant reservations, booking tickets to shows, cabarets, museums and exhibitions along with travel essentials like electrical adaptors plus there is a luggage hold, and butler service for a 24 hour room service where you can dine in the quiet of your room. Laundry and dry cleaning along with a shoe care service are available for an additional charge although there is an iron and ironing board you can utilise, plus you can also request a games console, computer, board games and card games along with in room massages by appointment. What used to be known as the after room where clients to relax with a drink at the end of the evening, breakfast is now served within the renamed Winter Garden between 7am and 11am. You have the option of a Continental style breakfast with hot beverages, a bakery basket of breads and pastries with jams, butter and honey plus freshly squeezed fruit juice, which is an approximate cost of €25 per person. However, for an additional charge you can opt for the American breakfast that also includes yoghurt, fresh fruit salad, cereals and two eggs that are cooked to your liking. Yet there are also a la carte options such as smoked salmon and a selection of French cheeses, plus a glass of champagne or rose champagne can be added to any of the breakfast options for a fabulous start to the day. Within this property there was once a room classed as a presentation room where the courtesan clients would meet first before going to one of the rooms, but this has now been changed into a luxurious lounge with a library and reading room, beautiful fireplace and rich woodwork with its library of books. 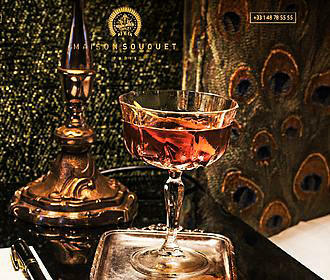 Here you will find that there is a hidden bar providing cocktails, fine wines and aged spirits, plus this is the area where you can enjoy refined cuisine of French specialities such as Duck foie gras served with fig chutney, Ossetra Royal Caviar (30 gr.) served with blini pancakes, Creamy Burrata, cherry tomatoes and taggiasche’ olives or Small sardines of the Galicia estuary to name few. Yet room service that is available 24 hours a day is also available for delights such as Black Rice flavoured with truffle, Smoked Salmon served with grilled toasts, Gaspacho and fresh mint leaves or Penne cooked with tomato and basil leaf, etc., all served within the bar restaurant as well. Located within a corner of the Maison, or House in English you will find a Spa with a Hammam and an indoor heated swimming pool known as the Souquet's Spa, which is decorated with a celestial ceiling of golden stars that shimmer and sparkle above the pool, adjacent to the hammam and treatment room. Only available to people staying within the hotel and those that request a key to enjoy the spa, classed as a secret spa that infuses magic and fantasy, it can also be reserved for complete private use upon request. The treatment room with professional staff are available by appointment for different massage treatments such as Californian, Balinese or Swedish along with foot reflexology to name a few. The Maison Souquet spa also offers beauty treatments for hands, feet, facials, pedicures, manicures, even makeup and hair styling specific to your requirements for a special event such as a wedding. All varying in cost, any treatment must be booked in advance and are available from 9am through to 7pm, although for an additional charge these can also be provided in the comfort of your room or also outside of these hours, even throughout the entire night. 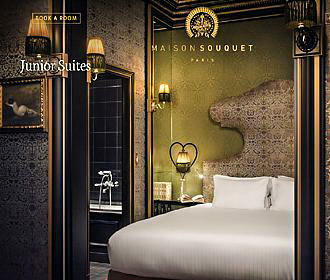 There are a total of 20 rooms and suites and this small 5 star hotel, each of them being totally unique in their designs, whether it be from the Napoleon III era through to Indian or Chinese inspired, and each has a specific name referring to one of the famous courtesans such as Castiglione and Belle Otero. Each of the rooms comes with an en suite marble bathroom with either a bathtub or walk in shower complete with bathrobes, hair dryer, magnifying mirror and Hermes complementary toiletries and perfume. Within each room, referred to as a Deluxe Room, which is approximately 16 to 18 metres squared, you will find a flat screen HD smart TV with international channels, free high speed broadband WiFi, personal safe, mini bar, individually controlled climate control for heating and cooling, along with 24 hour room service available and private access to the Spa. 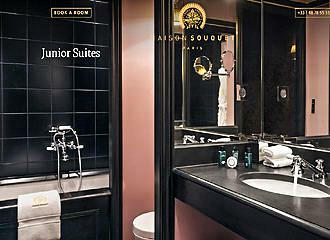 The Junior Suites come with a private entrance and a lounge for additional opportunities of relaxation and all feature unique lamps that have a heart shape plus unique paintings and art works, which have an area of approximately 26 to 28 metres squared and they could have a bath as well as a walk in shower depending upon the suite you are in. There are also two large suites that are approximately 55 metres squared and classed as 2 bedroom apartments, they encompass to junior suites and therefore you get two bedrooms along with two salons, or lounges a bathroom with a bath and a walk in shower. The first of these 2 bedroom apartments is called La Paiva, which is reminiscent of the social revenge achieved by a poor Russian weavers daughter who became a marquise and the most sought after woman in Paris at the time. The second is named after Liane de Pougy who was once a Folies Bergere star, renowned as one of the most beautiful and notorious courtesans in Paris, then became a princess and later on in life, a nun, in a true twist of events. Located in the 9th Arrondissement of Paris, the Maison Souquet is located close to many tourist attractions including the famous Moulin Rouge cabaret and the nearest Metro station is the Blanche stop serving Line 2. However, a little further walk away in the opposite direction and you have the Place de Clichy Metro stop serving Lines 2 and 13. Yet the bus lines 30, 54, 74 and 95 along with the Noctilien Night Bus Service via lines N01 and N02 will also get you within close proximity of this unusual hotel in Paris.